Dallas-based L&B Realty Advisors LLP is acquiring a 250-unit luxury condominium in Makaweli, Kauai, and the Kalakaua Retail Center in Waikiki on behalf of investors and plans to close the deal in the next 30 days. The sale of the shopping center and the Kapalawai Resort will mark the latest in a series of Hawaii investments forged by L&B, a real estate advisor for institutional clients. L&B said yesterday that it had closed acquisitions of Kukui Grove Center and Kukui Marketplace on Kauai on behalf of investors. The firm also announced equity investments in the Coconut Grove Marketplace on the Big Island and Poipu Shopping Village on Kauai. L&B did not disclose the price of the acquisitions, values of investments or the identities of its investment clients. MN Capital Partners of Honolulu manages the Hawaii assets acquired by L&B as its joint venture partner. "Our joint venture with MN Capital and relationships within Hawaii's real estate community have proven an essential element in achieving our strategic portfolio goals for our clients," said G. Andrews Smith, L&B's chief executive. "We continue to seek other properties in Hawaii's favorable markets." Bank of Hawaii Corp., which recently raised its full-year earnings forecast, was downgraded yesterday to "hold" from "buy" by analyst Michael McMahon at Sandler O'Neill & Partners LP. The 12-month price target is $55 a share. Bankoh closed down $1.46 at $49.04 on the New York Stock Exchange. The Charles Dolan family yesterday withdrew its bid to take the Cablevision Systems Corp. private, after negotiating since June, and asked directors to approve a $3 billion dividend to shareholders. The family, which controls 71 percent of the vote and 22 percent of the equity in Cablevision, issued a terse statement saying that it "has become clear that we will be unable to reach an agreement" with directors. A dividend would net the Dolan family $600 million. The reversal again raised speculation about what the Dolans would do next. Since April, Charles F. Dolan, who had been at odds with his son, James L. Dolan, Cablevision's chief executive, over the elder Dolan's support for the satellite television service Voom, has reconciled. Whether that reconciliation muted Dolan's appetite to split the company remains unclear. The Dolans had offered $21 a share for the Cablevision cable systems company and $12.50 a share for a stake in Rainbow Media Holdings, its cable networks company that includes American Movie Classics, Independent Film Channel and Women's Entertainment, for a total bid of $33.50 a share. » Helber Hastert & Fee, Planners Inc. has hired Jennifer Higa as office manager. She will be responsible for overseeing the administrative, financial and human resource operations of the firm. She previously worked in Japan teaching English for two years. » Goodwill Industries of Hawaii has hired Liz Camat as its development manager. She will be responsible for coordinating projects, campaigns and activities promoting and supporting the organization's long-term fund-raising program. She previously served as the Girl Scouts of Hawaii sales and marketing director. » Charles Pankow Builders Ltd. has announced the addition of James Bauckham and Daniel G. Vasilash Jr. to the management team. Vasilash has joined the firm as safety coordinator. He will be responsible for implementing the company's safety program and policies. Bauckham, the new project sponsor, will be responsible for overseeing all aspects of a project, from preconstruction through design and construction. » Hawaiian Airlines has appointed Matt Bernier senior director -- labor relations. He will be responsible for administering the contracts of the company's six labor groups covering wages and benefits for unionized employees. He has six years of airline experience, mostly in Phoenix as manager of labor relations for America West Airlines. 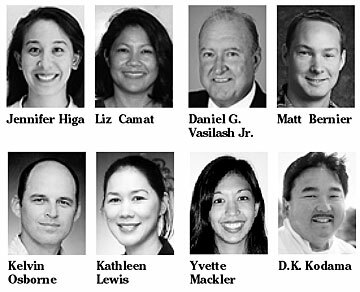 » Miller/Watts Constructors Inc. has hired Kelvin Osborne as operations manager for Hawaii and the Pacific, and Kathleen Lewis as the company's Honolulu office manager. Osborne will supervise all of the company's operations in Hawaii. He has over 20 years of industry experience. Miller will oversee human resources and assist in all administrative operations for the company in Hawaii and the Northern Pacific. She has 15 years of experience in the construction industry. » McNeil Wilson Communications has appointed Yvette Mackler assistant account executive. She will serve in the travel and tourism division. She has been with the company since May 2004. » The Hawaii Foodbank board of directors has appointed Mary Fallon and D.K. Kodama to three-year terms. Fallon is the wife of Adm. William Fallon, Pacific Command. She has been an active board member for both civilian and military organizations. Kodama owns Sansei Seafood Restaurant & Sushi Bar.